This specimen is a set of butterfly wings that we found on the ground. They are glued to a yellow card. Like the previous specimen page examples, this one is made from archival photograph holders. This one is designed for vertical 3 1/2" x 5" prints. To make it, I folded the photo page in half and secured the other side with tape. I trimmed the top, but not flush. I made the top so that the upper pocket would have a flap that could fold into the pocket. 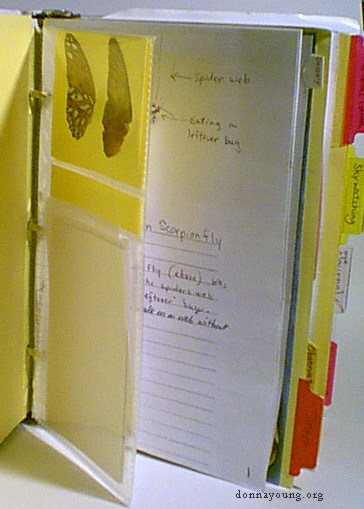 The flap secures the specimen card and prevents it from falling out the top. This specimen page uses all four sleeves from a photo sheet. The top is trimmed in a way so that the excess height is made into flaps that is folded and inserted into the top sleeves.